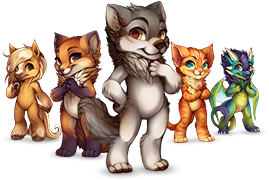 An easy to read and navigate Guide for all the BBCode that can be used on Furvilla! BBCode is written with [ ] 's at the beginning and end of sentences. You can even use colours! You can also post images! They can be resized however you like. Images can also be clickable links, like this! Wanna make some floating text? Try hovering over this: I'm hiding text! You can add Youtube videos to your posts! Do you wanna make a list? You can also put a after the list= to get an alphabetical list. You use [tr][/tr] to denote a new row in your table. [td][/td] Helps with columns! In order to make code not appear in code (like in this guide), or type in monospaced text, use this code! ** Because the /code was used twice in a row and therefore ~breaks~ the code, a space was used between the / and code to fix it. So have fun building whatever you like with this code!